JCPenney: Mystery Coupon Giveaway + FREE Chocolate Bar! Starting today and running through April 20th, head to participating JCPenney stores because they will be handing out FREE Sweet Sale Chocolate Bars! Each bar will have a coupon inside valid for 30%, 40% or 50% off your entire purchase of select apparel, shoes, accessories, and more! Chocolate bars with coupons are available in-store only while supplies last, and there’s a limit of one per person. Exclusions will apply. 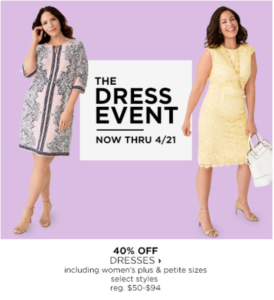 Now through April 21st, you can get 40% off dresses at JCPenney! Valid on select styles only. 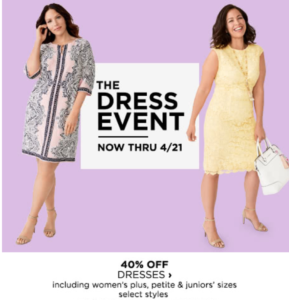 JCPenney: $10, $20 or $50 Coupon Giveaway – April 13th! On April 13th, head to JCPenney to get a free $10 off $10, $20 off $20 or $50 off $50 coupon! Only valid while supplies last, so hurry in! Quantities are limited. JCPenney: $22.99 Women’s Arizona Sandals! Right now at JCPenney, Women’s Arizona sandals are on sale for $22.99! Valid on select styles only. Regularly $40. JCPenney: Up to 80% off Final Take Clearance! Right now at JCPenney, you can get up to 80% off Final Take Clearance! Valid in store & online. 50% off Xersion Activewear for the Family at JCPenney! Right now at JCPenney, Xersion Activewear for the Family is 50% off! 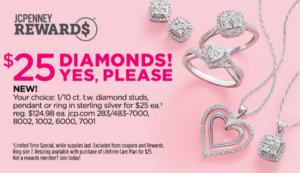 JCPenney: $25 Genuine Diamond Jewelry! Right now at JCPenney, you can get Genuine Diamond Jewelry for $25.00! It regularly sells for $124.98. Must be a JCPenney Rewards member to get this deal. JCPenney: $10 off $10 Coupon Giveaway – TODAY! Today, head to JCPenney to get a free $10 off $10 coupon! Only valid while supplies last, so hurry in! Quantities are limited. 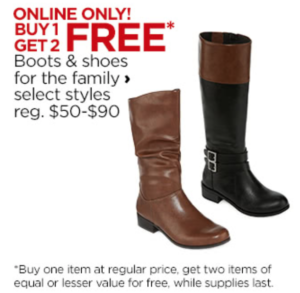 JCPenney: Buy 1 Get 2 FREE Boots for the Family! Right now at JCPenney.com, you can get buy 1 and get 2 FREE on select Boots for the Family! Prices start at $50. Click HERE to start shopping now!